If you’ve been waiting for the right kit for illustrator text effects, you don’t have to wait any longer. 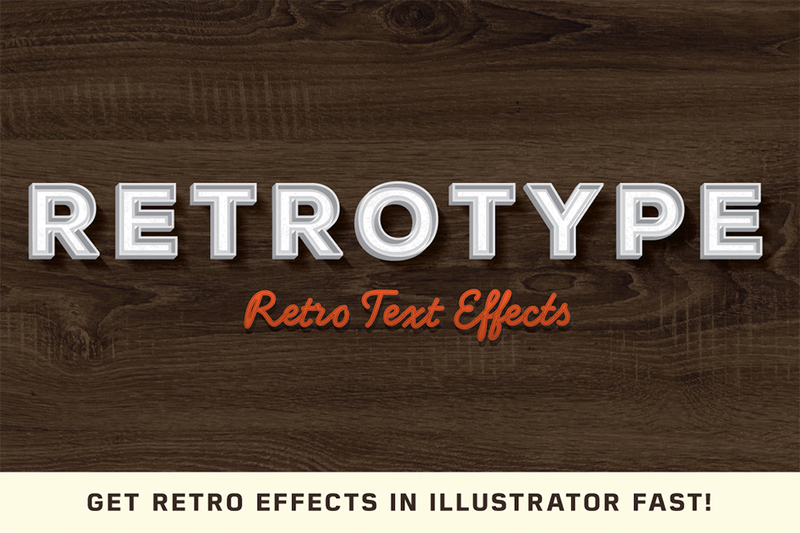 RetroType gives you a collection of authentic retro effects & text styles that you can apply to your designs quick and easy. • Layer styles constructed of dozens of carefully crafted layers. • Over 10 hours building and testing the effects. • Real halftone patterns scanned, processed, converted to vector and cleaned up. • Hundreds of high resolution photos were taken in order to find just the right textures. • Inspired by real source material from 1950’s diners, motels and drive-thrus. Software compatibility: Adobe Illustrator CS4 and newer. 13 instant retro text effects including: original 3D, metal letters 3D, offset lithography and more. 9 seamless aged vector patterns created from real-life source material. 5 bonus elements including arrows. bulbs and marquee style. File size is approx 34.3MB (47.2MB unzipped), offered as a single download. I have what might be a silly or perhaps obvious question, but I have been working in Photoshop for many years, and I am now just learning to use Illustrator. What I am wondering is if the “13 instant text effects” in this set are simply layer styles that can be applied not only to text but to shapes/graphics as well? As a simple example … if I create a star shape, can I then just apply the offset lithography effect to the shape, and it will have a similar appearance to the letter M used in the preview above? I apologize in advance if this is an obvious question to most! What a great question, thank you so much for leaving us a comment and I can definitely help you with this!